Awesome 3 slaapkamer huis genesteld in een rustige buurt in de buurt van Zion National Park. Dit geweldige huis met 3 slaapkamers is smaakvol ingericht. De ruime open ruimte die de keuken, eetkamer en de woonkamer met elkaar verbindt, creëert een leuke verzamelruimte. De keuken is volledig ingericht, inclusief een aantal basis kookbenodigdheden. De prachtig ingerichte master suite is voorzien van een kingsize bed, een grote tv, een inloopkast, een groot hoofdbad met een ligbad, dubbele wastafels en een douche. De tweede slaapkamer heeft een queensize bed en slaapkamer # 3 heeft twee eenpersoonsbedden. Het huis slaapt comfortabel 6. Een prachtige plek om thuis te komen na een avontuurlijke dag, wandelen, fietsen, golfen of sight-seeing. Wonderful home to stay in while visiting the Zion National Park area. It was extremely clean and comfortable. Excellent location to visit the parks and have easy and quick access to great restaurants, services, and entertainment. Highly recommended! Great home, great location, great hosts. Me, my wife, my sister and brother-in-law just spent 3 days in this lovely rental. The house was nicely furnished and well equipped with everything we needed. The location was perfect for visiting Zion. Last time I was at Zion I stayed in St. George. This is sooo much better. Best of all, Gary and Eileen were the nicest people to have as hosts. They did everything possible to ensure that we had the best experience while in their rental. I would recommend this home to anyone visiting the area. This is our fourth year vacationing at a VRBO rental for a month and it's been our best experience yet! The house was exceptionally clean and spacious with a very nice, open layout. The master bedroom/bath is very private from the rest of the house, and includes a walk-in closet which we really liked. The beds were very comfortable. There was plenty of extra bedding including blankets and pillows in the closets. We found the bath towels to be nice and thick and there was never a shortage of any. The kitchen was fully equipped and we used it often. I was especially impressed with their high-quality cookware. 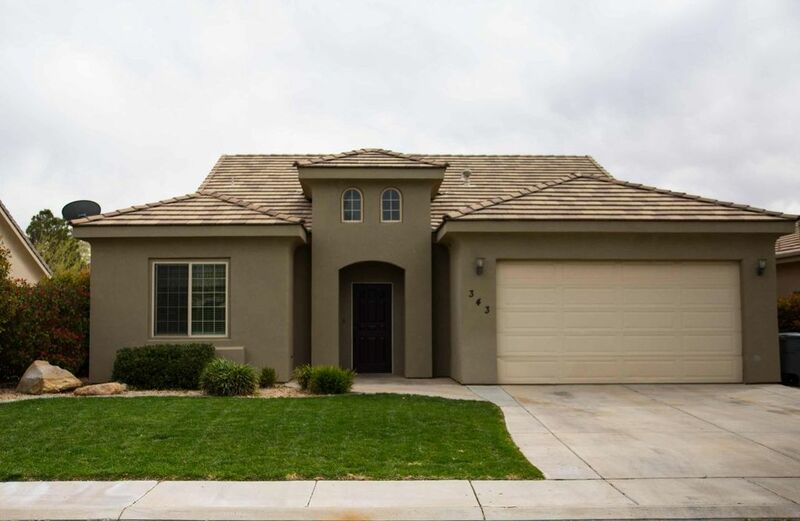 Some of my husband's favorite aspects of the house were the keyless entry, the large, immaculately clean garage, and the private backyard complete with gas grill and fire pit. We ate our meals out there often. When we did choose to venture out for dinner, we found many diverse restaurants very conveniently located. Our hosts, Gary and Eileen were "over the top" gracious throughout our entire stay. They were always available when we had questions about the property or the area. We would have never experienced some of the sights and extracurricular activities without their advice and insight. They truly are wonderful people and we're blessed to be able to consider them friends following our stay. Southwest Utah is one of the most beautiful places in this entire country. We WILL be back, and know exactly where we'll be staying again! We stayed at this wonderful house end of December. We had a great time ! Eileen and Gary were great host. Responded to every email very quickly and made us feel very welcomed. They even left a welcome note which was so thoughtful. The house itself was beautiful, spotless and very comfortable. It was nice and warm even when it got very windy/cold outside thanks to the Nest thermostat. It gets the right amount of sunshine and very high ceilings which we don't always see in the US. Location is perfect. Near St George and Zion national park. It is located in front of small playground which was great for the kids to go out and play. Overall we had a great stay and would recommend this place very highly!!! We really enjoyed our stay using the home as a base for our visit to Zion. Awesome value! I would not hesitate to book again! We took a 3night/4 day QUICK trip and this home was PERFECT! The home was very clean, welcoming, and nicely decorated. The neighborhood was quiet and conveniently located for our adventure needs. The homeowners supplied ALL the necessities to make this stay comfortable. All the way to the laundry soap/dryer sheets! We were so happy to utilize the crockpot to make our dinner more convenient when returning home late. The Farm Market grocery has a small-town feel and only 5min from the home. Although slightly pricey, you can grab snacks, sub sandwiches, fruit cups, for your hiking/biking needs. They also sell beer in case you need an adult beverage. Jem Trail in Virgin, UT, (which is otw to Zion National Park) has a few kid-friendly bike trails and roads to ride on. We used the app, SingleTracks, to help us find bike trails which was super helpful. If you have the time, go to Bryce Canyon, because it is GORGEOUS!! It is about a 2hr drive and the quickest route is thru Zion National Park. Well worth it! If you are driving back home at night, esp thru the park, BE EXTRA CAUTIOUS for Deer and Elk crossings. Overall, we could not have been more happy with this rental and we WILL definitely be staying here again. Thank you Gary & Eileen for EVERYTHING! Dit prachtig ingerichte 3 slaapkamers en 2 badkamers huis is gelegen in een rustige wijk op slechts 25 minuten afstand van de hoofdingang van één van de meest populaire nationale parken in het land, Zion National Park. Een gemakkelijke rit naar andere mooie nationale parken, Kolob Canyon, Bryce Canyon National Park, Grand Canyon, en de Grand Staircase Escalante National Park. Het hele jaar door activiteiten in de nabijgelegen staatsparken, meren en recreatiegebieden, zoals Quail Lake, Sand Hollow en Snow Canyon State Parks. Southern Utah Retreat Dichtbij Zion en MEER! Wereldklasse mountainbiken op slechts enkele minuten. Voldoende parkeergelegenheid beschikbaar voor uw voertuigen. (garage, plus de parkeerplaats aan de zijstraten). Geniet 's ochtends van het ontbijt of' s avonds van een barbecue op het terras.